“SINGULARITY AFTERMATH” part four! Cyborg, Beast Boy and Variant battle an army of deadly mecha-humans in their epic and final cybernetic showdown with Anomaly that will seal the fate of mankind! Can Vic and his team save the planet, or will they fall victim to the viral contagion threatening to turn them into mindless automatons? “METAL VS. METTLE”! With the cure for the O.T.A.C. virus within reach, Cyborg must join forces with his corrupted doppelgänger or dismantle him and end this war once and for all. Meanwhile, Anomaly escapes S.T.A.R. Labs only to come face to face with the creature who destroyed the world. Is this world too far gone to be saved-and worse, is this foreshadowing what will become of our world?! “THE IMITATION OF LIFE” part six! Led by Silas Stone, S.T.A.R. Labs takes drastic measures to decommission Cyborg! Confound inside his immobile body, Cyborg seeks help from an unlikely ally who, with help of virtual Victor, must break into S.T.A.R. Labs to reactive Cyborg. Today we have an exclusive story from the Bizarre New World Kickstarter running now. Bizarre New World started production on October 10, 2005 and was originally released by Ape Entertainment as a critically acclaimed 3 issue mini-series in 2007, followed by a mini-graphic novel sequel in 2008. These books totaled 140 pages. Work on the rest of the tale and short stories never stopped and was completely finished on February 5, 2015. The final project clocks in at 503 pages. That’s the 278 page graphic novel and a 225 page short story anthology. Now Skipper Martin is partnering up with fellow Ape Entertainment creator Troy Dyeto to release their books through their new publishing imprint called Fractured Entertainment. The anthology features a massive amount of creators, the full list you can find below. But we have an exclusive short story, a prime example of what you’re going to find in the anthology. Liftoff Takedown is written by Wilfredo S. Duran, with pencils by Dexter Wee, colors by Michael Spicer, lettering by Bernie Lee and edited by Skipper Martin. 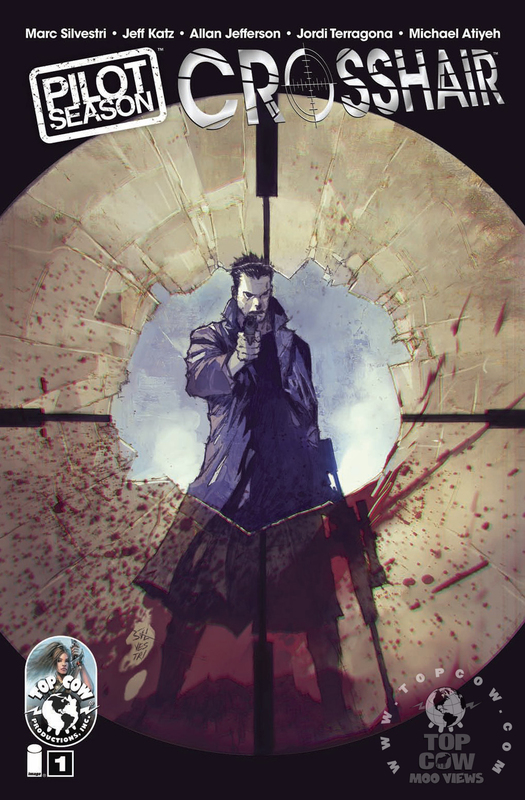 If you could take the television show 24 mash it with the movie classic The Manchurian Candidate and put it in comic book form, you’d come pretty close to Crosshair #1. Created and co-written by Top Cow founder Marc Silvestri and co-writer Jeff Katz with art by Allan Jefferson the comic is a kinetic and at times confusing look at a man who knows he’s programmed to kill the President in 48 hours and the only person that can stop him is…. himself. Pilot Season Begins Anew as a 5 Week Event in 2010! After settling into the life of loving husband and devoted father in the suburbs, a former assassin for the CIA learns he’s been brainwashed to kill the President of the United States. To his horror, Justin Weller has discovered that in less than 48 hours something or someone will trigger his suppressed program and send him into deadly and irreversible action. Weller must discover his triggering mechanism and uncover who is behind the conspiracy that will pitch the world into chaos. Created and co-written by Top Cow founder Marc Silvestri (X-Men/Dark Avengers: Utopia) and co-writer Jeff Katz (Booster Gold) with art by Allan Jefferson (War Machine), Crosshair introduces a new kind of action comic. I love the concept, the execution on the other hand is a bit scattered. The story isn’t linear, instead we’re given out of sequence scenes, which would be fine and work on television, but doesn’t quite get pulled off on the comic page. Instead the comic comes off as having ADHD and at times incoherent and at other times, just plain silly. Again, the concept is great, and art pretty solid. This is an action comic with the comic version of cut scenes and jump scenes. It’s kinetic, and jumpy, in a bad way. Pilot Season is a contest after all, so out of the three releases so far, this one trails in my opinion and it’s a distant third at that.